1 Open Settings from iPhone dashboard. 2 Navigate to General > Network > VPN > Settings. 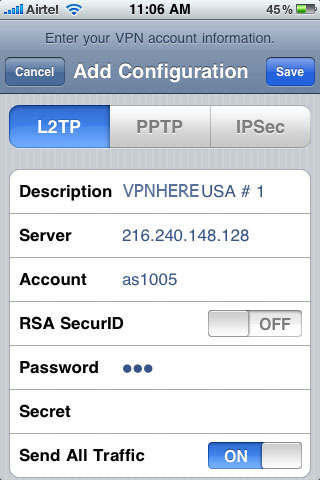 3 Select whether you are connecting via L2TP or PPTP at the top. 4 Complete the settings and tap Save. 5 Once configured you can see the VPN profile. 6 To get connected tap on VPN toggle and you are good to go, once connected you will see a VPN icon next to the clock.